As you all know, I have two daughters, Olivia and Bridget, whom I love so dearly. I keep their pictures in my wallet so I can see them when we are not together and now I have a new way to keep them close to my heart thanks to Charitable Creations. 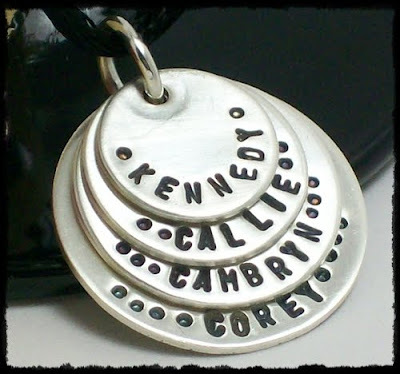 Charitable Creations is company that makes personalized hand stamp jewelry that allows you to cherish and honour the people you love. These designs are one a kind and are made to last you a lifetime. They have a wide selection including necklaces, charms and earrings to name a few. Each piece is made uniquely for you and can be personalized any way you like. Each letter is handstamped individually and is oxidized with an environmentally friendly oxidizing solution to ensure that it lasts you for a long time. Not only do they make beautiful hand crafted jewelry, but they also give back to charity. This is a company with a strong social conscience and I commend them! They will give 10% of your total order to a charity of your choice so just by shopping with them, you are raising much needed funds for your favourite charity or organization. This helps to set Charitable Creations apart from their competition because they work with YOU to make a difference. I received the Hand Stamped Sterling Silver Family Necklace for my review. It was personalized just for me to say my girl’s names- “Olivia” and “Bridget”. Actually my necklace is featured on their site! I was very excited to see it up there. 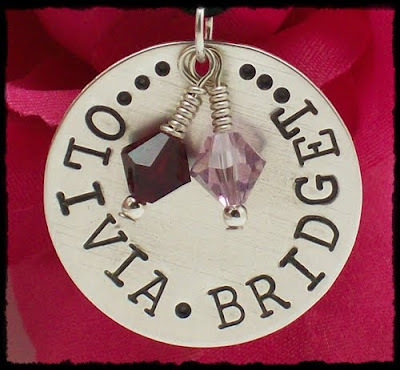 It came with two Swarovski birthstones to reflect the month each of my daughters was born (Olivia- July, Bridget- October). Isn’t it exquisite? I think it is absolutely gorgeous and I LOVE wearing it. It has a very special meaning to me and I will always cherish it. This particular necklace can be stamped with up to four names and four birthstones so if you have four or less children you could put each name on it. Or you could use it for you and your husband/partner. Either way, it is a keepsake for you. Plus, Charitable Creations has affordable prices so you won’t have to break the bank to buy a nice gift for yourself or someone else. My necklace costs $40 and is worth every penny. You can purchase from the Charitable Creations website or their Etsy shop.